Mr. Windows 2000-XP can open the file cabinet (NTFS), the desk drawer (FAT32), and the paper sorter (FAT16) without a problem. 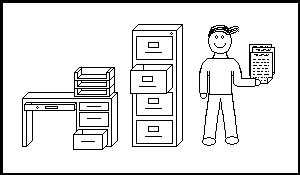 Mr. Windows9x can only reach the papers (files) from the paper sorter (FAT16) and the desk drawer (FAT32). 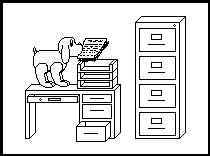 Some smaller dogs (Windows 95a) can only get to the paper sorter because they are too weak to open drawers. Windows NT Jr. can only open the file cabinet (NTFS) and the paper sorter (FAT16). He can't get the desk drawer (FAT32) open because he doesn't know you have to open the larger drawer first. What if we wanted to move a paper (file) from Mr. Windows2000-XP, who has put the paper (file) into his file cabinet (NTFS), to Mr. Windows9x so he can put the paper (file) into his desk drawer (FAT32) over the network? Well Mr. Windows9x doesn't go to Mr. windows2000-XP's file cabinet, he would hit him with a broom. So Mr. Windows9x asks SMB the ghost who runs the network to ask Mr. Windows2000-XP for the papers (files). 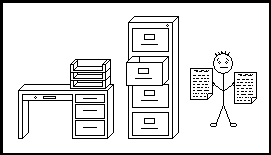 SMB then asks Mr. Windows2000-XP if Mr. Windows9x can have the papers (files). Mr. Windows2000-XP checks his clipboard (ACL) if it's ok. He then gives SMB the files from the file cabinet (NTFS), SMB then runs back to Mr. Windows9x and he puts the files into his desk drawer (FAT32). 5,219,400 Hits on this page since July 20th, 2003. Page loaded in 0.003 seconds.